Happy Halloween! Why not feed your little hobgoblins a nutritious, fun breakfast before the trick-or-treat candy overload? In this recipe, harvest pumpkin is seasoned with chipotle, then oven-roasted to a sweet and smoky blend. Roast the pumpkin in the evening, if you like, and wafts of cinnamon and spice will scent your kitchen with autumn aromas. Consider serving some smoky pumpkin with dinner as a seasonal side. 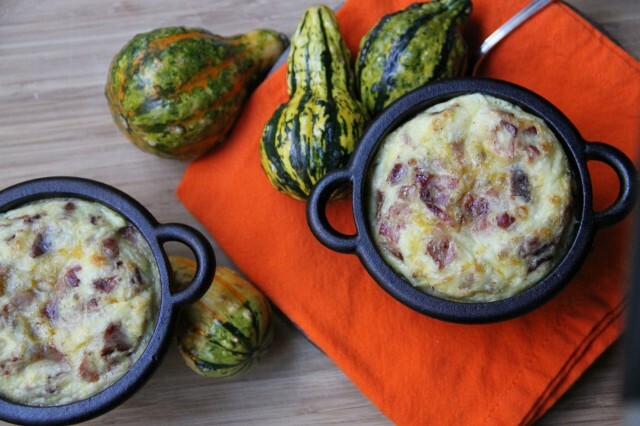 In the morning, fill your little cast iron cauldrons with roasted pumpkin, then top with a bacon, egg and cheese mix that puffs up to a lovely golden brown when baked. Dig in deep, to fill your spoon with a Halloween flavor-packed combo, and a smoky, holiday breakfast in bed suitable for even the fussiest hobgoblin. Note: I purchased my amazing little cauldrons from Lodge Manufacturing, a family-owned Tennessee company more than 100 years old. These cast iron gems provide great, even cooking, and an irresistible presentation! To roast pumpkin, preheat oven to 350°. Using large knife, slice pumpkin in half, just to one side of the stem. With a metal spoon, scoop out seeds and pulp, scraping sides of pumpkin until clean and smooth. Slice pumpkin into strips approximately ½ inch thick. Mix olive oil and chipotle pepper. 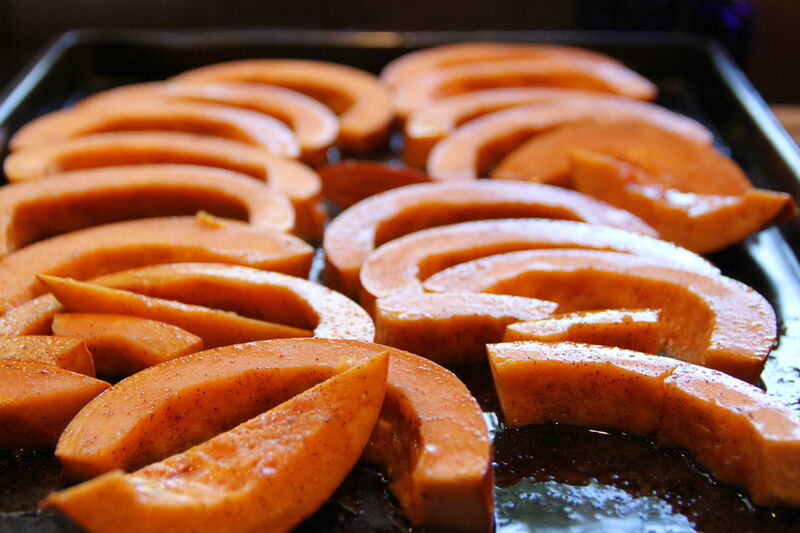 Brush olive oil mixture on pumpkin slices and place on heavy baking sheet. Bake for 25 to 30 minutes, turning once, until pumpkin is lightly browned and cooked through. Remove pumpkin from oven and let cool until it can be handled. Remove skin with paring knife, and chop pumpkin slices into small cubes, approximately ½ inch square and set aside. 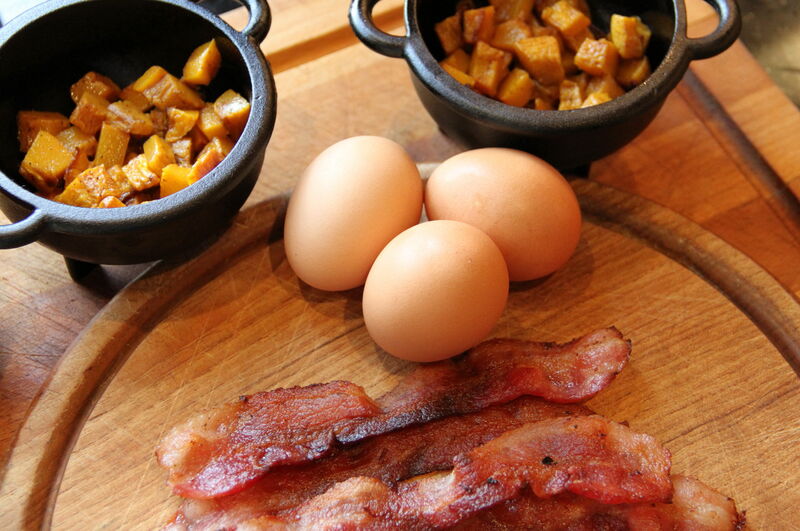 Place bacon in heavy skillet, and cook on medium low to medium heat until crisped, about 8 to 10 minutes, turning several times. Drain on paper towels, cool, and chop into small pieces. Set aside. Crack eggs into medium bowl and whisk until thick and smooth. Stir in mozzarella cheese, chopped bacon, and salt and pepper to taste. 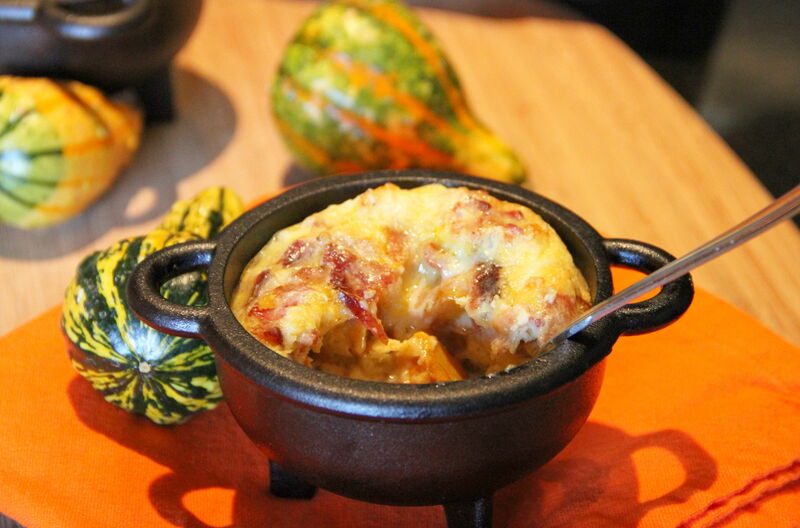 Lightly oil cauldrons (½-pint baking dishes), and place ⅓ cup of chopped, roasted pumpkin into each of two cauldrons. Pour egg mixture evenly into each cauldron, on top of pumpkin. Bake at 350° for 25 to 30 minutes, until eggs are cooked through and puffed up. Bedroom Design: Hooray for Houndstooth! Houndstooth is one of my all time favorite graphic patterns. From iconic Chanel to daring Alexander McQueen, it has been a Scottish inspiration on the runaway for centuries. And for all my football fans reading this, houndstooth can be summed up in 2 words: Bear Bryant. Its versatile, graphic pattern can be as daring or as subtle as one would like. Fun fact for the day: a smaller-scale version of the pattern is called “puppytooth”! How cute! If I ever wanted to give my bedroom a dose of good, old-fashioned sophistication and elegance, there is no doubt I would utilize this pattern. 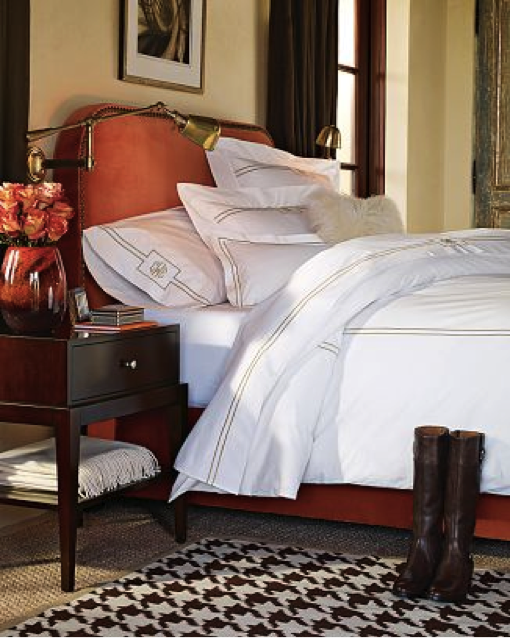 I love the crushed velvet orange bed frame in the bedroom, but what I really noticed was the houndstooth rug. 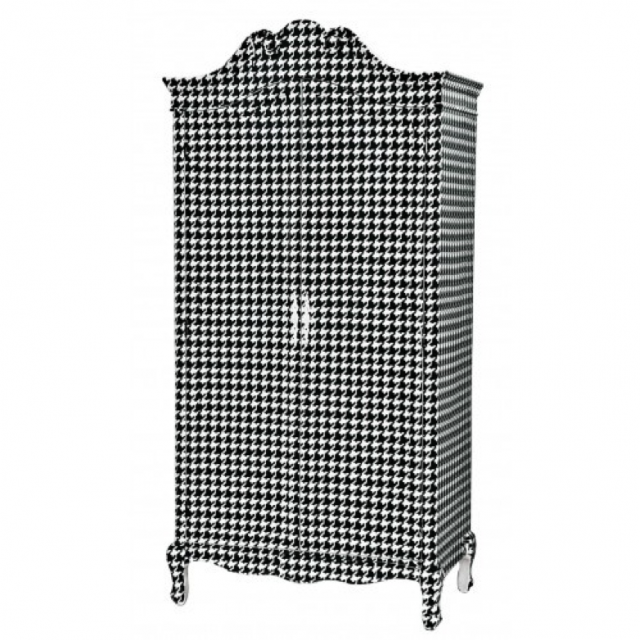 Its crisp black and white pattern is the perfect preppy fall accent. There’s another trend here that also caught my eye. Just as layering clothes keeps you warm, layering rugs have a similar effect. Not only does the technique add visual interest and texture to the floor, but it’s also so practical and easy to mimic. A quiet sisal rug as the base layer happily allows the houndstooth pattern to strut its monochromatic colors and anchor the space in the bedroom. And for the finishing touch that is essential but often overlooked, a vase of roses in a balancing hue keeps the bedroom timeless and romantic. Usually, houndstooth is black and white, but it can also appear in varying shades. It is just as, if not more, wonderful in shades of red or navy. Or if black and white is too bold and busy, a nice neutral beige can often be the answer. 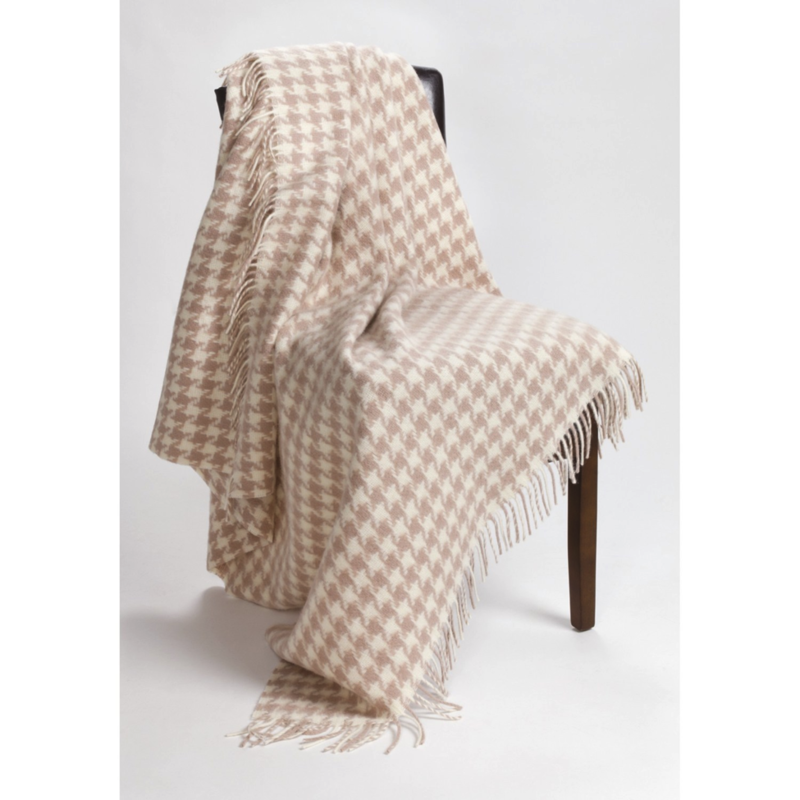 This handsome wool throw by Moon of England is complements any bedroom decor without overwhelming the space. On the opposite spectrum, if I was looking for a statement piece, this one of a kind Pied-de-Poule armoire by Seletti would be it. Getting dressed on groggy fall mornings will be definitely be more interesting with a jolt of fun and drama. 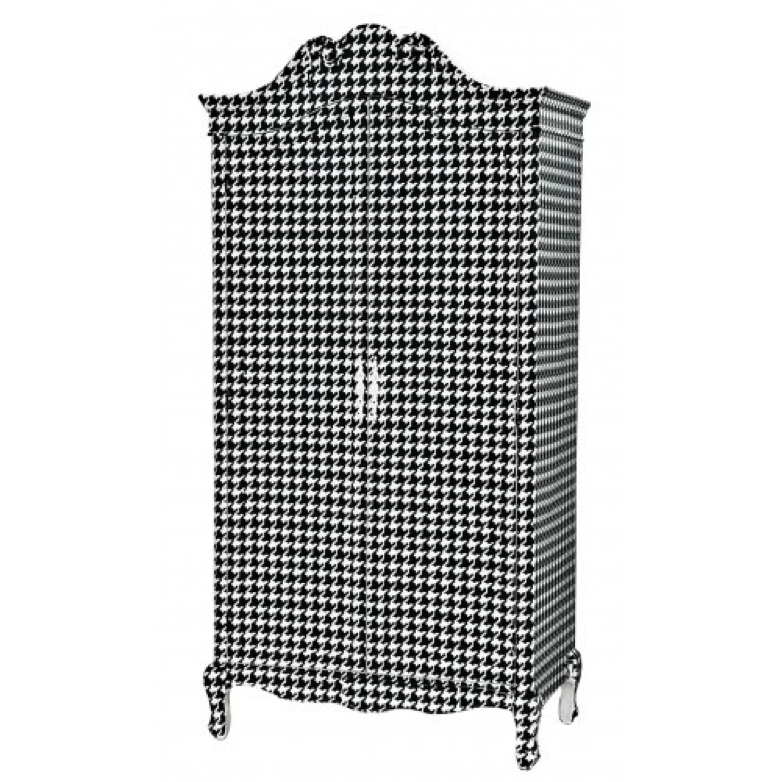 The armoire is made of MDF with a silkscreened houndstooth pattern. I’m not quite sure where I would put it yet, but what I am sure of is I’d have a psychedelic start to any day. The Summer People by Kelly Link. Okay, so I have a couple caveats here. First of all, this is actually just a short story in a collection, edited by Kelly Link called Steampunk!. It’s a bunch of stories by a number of well-known teen authors such as Libba Bray, Garth Nix and, of course, Ms. Link has her own story in there as well. 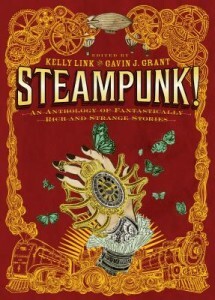 Since I can’t find my copy of Kelly Link’s Pretty Monsters (which, by the way, I reviewed for this blog last year) which I really wanted to read I was excited to find this new story of hers in this collection of steampunk-themed tales. Hers is actually not steampunk in the slightest; there is nary a reference to gears or pistons—but hey, she’s the editor, she could publish a recipe in this book if she wanted (which would probably be totally creepy and weird and I’d totally read it)—but I’m actually quite glad. Reading through the other stories I realized that I’m just not that into the whole steampunk thing. Which isn’t to say that they aren’t good; these are some of my favorite authors. I can only take so many gears and smoke and steam. The loss of innocence, as you well know dear readers, far exceeds just the complicated conundrums of sayonara sock simians. In an age when colony collapse disorder is robbing the world of honey whilst Honey Boo Boo showers the world with sass, it can be difficult to ascertain what truly matters and why, in the end, we’re supposed to care at all. 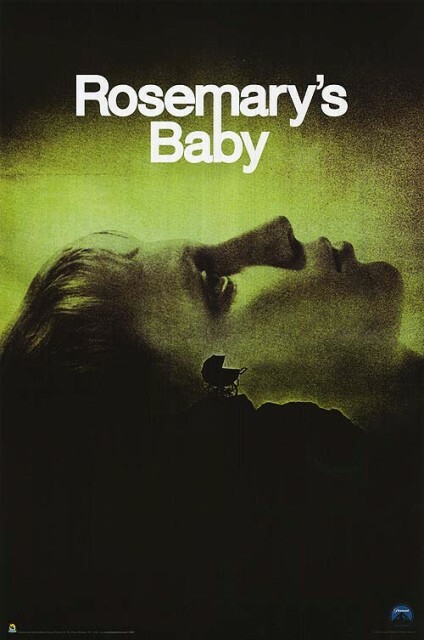 Really, think about it: Compared to the miseries that befall Rosemary Woodhouse as she unwittingly sets down a path that will lead her to give birth to the son of Satan, is an overdue electric bill or a missing monkey THAT big of a deal? Sure, it can be a bit of a pain to spend your afternoon on hold, listening to Phil Collins plead to be taken home while the winter’s darkness envelopes your frigid studio apartment, but it’s not as if your husband and a coven of witchy senior citizens secretly made you bring forth the antichrist. It’s all about perspective. A classic of horror cinema, Roman Polanski’s “Rosemary’s Baby” takes the idea of forced demonic birth (typically a bummer) and uses it as a metaphor for the inability of our reality to always match up with our hopes and aspirations. Rosemary may think that she’s got the ideal life she always dreamed of, what with her fancy Vidal Sassoon haircut, actor husband, and enormous apartment on the Upper West Side, but the fact of the matter is that the woman has severely underestimated the tenant requirements in her snazzy new co-op. Needless to say, it pays to read the fine print when Beelzebub is on your building’s board of directors. As you can imagine, life quickly becomes a nightmare for Rosemary as the forces of darkness conspire to give her morning sickness. What’s worse, while she is suffering—saddled with the upheaval of both her dreams and last night’s dinner—her husband is engaging in nefarious games of paranormal pinochle with the witches and warlocks down in Apt. 6B. Where is the humanity!? Alas, life, it seems, is a losing game for Rosemary, with the cards definitely stacked in Ol’ Scratch’s favor. As you’ve probably guessed by now, I like to explore alternative ways people sleep. Whether that’s on a block of ice in the ICEHOTEL, in a hammock somewhere tropical, or underwater, there’s a number of ways you can get a good (or at least novel) night’s rest outside of the traditional bedroom. This week, we’re headed offshore and I’ll introduce you to the idea of sleeping on a boat. When you’re on a boat, the bedroom is referred to as the “berth.” According to the Online Etymology Dictionary, the word berth dates back to the 1620’s and refers generally to a “convenient sea room.” It’s of uncertain origin, but is thought to have come from a combination of the word bear (the verb) and the suffix –th, which is used to turn verbs into nouns. The use of the word berth has been extended to refer to sleeping quarters in all types of transportation, including: planes, trains, and automobiles. Space on a boat is limited, and designers are challenged to use every available square inch inside a boat efficiently. 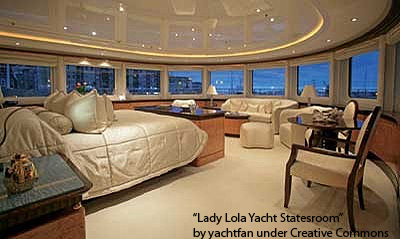 Thus, the master bedroom (berth) on “normal-sized” boats are typically located in the fore (front) hull of the vessel. These types of berths are known as a V-berth, due to the shape of the interior. Since the front compartments in boats are irregularly shaped, mattresses in a V-berth must be specially crafted to fill in the triangular gap that would otherwise be present with a rectangular mattress. Larger vessels may feature additional sleeping quarters along the sides and towards the rear of the ship, and generally have more latitude in the design of the rooms. 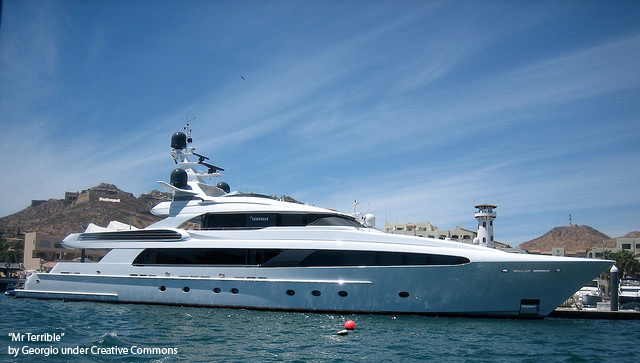 Check out the picture below: berths can be quite luxurious! It’s up for debate whether the front of the rear (aft) of a ship is more stable for sleeping, but most of the ultra-mega yachts I’ve seen on television all feature the master suite in the front. You’re also likely to find the luxury suites on cruise ships at the front. While sleeping on a boat isn’t for everyone (some people just aren’t comfortable being on the water, or get sea sick), many seafaring types find that sleeping on a boat is quite relaxing. In calm seas, the gentle rocking of the boat helps lull you to sleep (a similar effect of sleeping in a hammock). Additionally, boating imbues a sense of excitement for the adventures that lay ahead. You can also experience amazing sunsets that below the unobstructed ocean horizon, and views are simply unobtainable from land. Have you ever slept in a berth? Do you prefer the fore or the aft of the ship? Share your experiences in the comments below.